Tran, a notorious Vietnamese insurgent, seems to offer the perfect escape from her troubles, while Mark, a charming American trader, is the man she's always dreamed of. But who can she trust in this world where no one is what they seem? 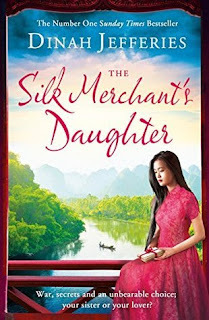 The Silk Merchant's Daughter is a captivating tale of dark secrets, sisterly rivalry and love against the odds, enchantingly set in colonial era Vietnam. Review: The Silk Merchant's Daughter is my first book by Dinah Jefferies and it won't be the last for sure. What an amazing and captivating story it is. I love the kind of books that transport you to another place, to another time (one you have no idea about) and make you part of it. And this is one of these reads. In fact, one thing I love about historical fiction is learning about the past, our past, and with this story I learned a lot. The book is set in Hanoi, Vietnam, in the early 50s and focuses on Nicole and her struggles with identity and belonging. With a French father and a (late) Vietnamese mother, Nicole has inherited her mother's looks so she is often called "métisse", something that makes her feel uncomfortable and out of place. Her older sister though has their father's looks and seems to be the preferred daughter. Nicole's self doubts only increase as the story unfolds and Vietnam becomes a very dangerous place. The French government is loosing its power as the nationalist Vietminh gain power and support. And soon, Nicole finds herself having to decide which side she is going to support. Between all this turmoil, there's also space for romance. Early in the story, Nicole meets a dashing American that makes her heart flutter. But he seems to have many secrets and a special connection with her sister. So when an enthusiastic and persuasive young Vietnamese enters her life, she must decide, once more, which life she is going to choose. An extremely difficult decision when you no longer knows who's your friend and who's your enemy. The story surprised me more than once and I certainly had no idea how it was going to unfold. Something that kept me glued to its pages for hours. Something that Dinah Jefferies perfectly accomplishes with this novel is transporting you to Vietnam in those difficult years. She has a way with words that make you feel part of the place she is describing. Her attention to detail is incredible, with generous descriptions of the surroundings, the buildings, the food and the smells, even the touch. I felt like I could almost touch the silk rolls and hear the old buildings cracking under my feet. The Silk Merchant's Daughter is a story with many layers. There's war but also love, betrayal but also forgiveness, doubts but also certainties. It captures perfectly what it means being part of two completely different cultures but not belonging to either. It's something that has made me think a lot and I'm sure this story will stay with me for a long time. A novel I highly recommend. I'm so much looking forward to reading this book. Nice Review! I read the tea planters wife, and loved it, so in looking forward to this new one!